"The garment in my wardrobe that I cherish most is one that I never actually wear. Not because it is too precious to be worn, but because it is a sweater made for a two year old, which does present slight issues for a six foot frame. 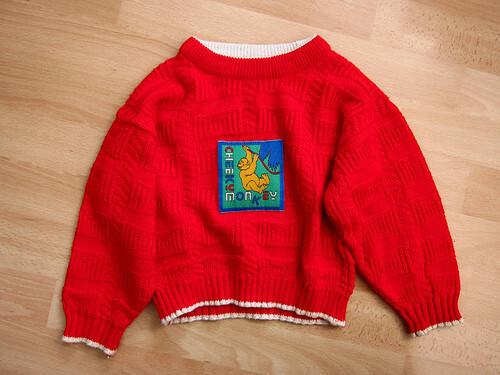 It is a bright red acrylic sweater with an image of a yellow primate and the words "Cheeky Monkey" sewn on in the form of a patch. Aside from family photographs and my memory box, it is the only material object I own that I would go out of my way to save from a fire." "In terms of garments that I actually wear, the item I treasure most is perhaps not the most interesting or exciting I own, but it is one I view as marking a personal turning point. 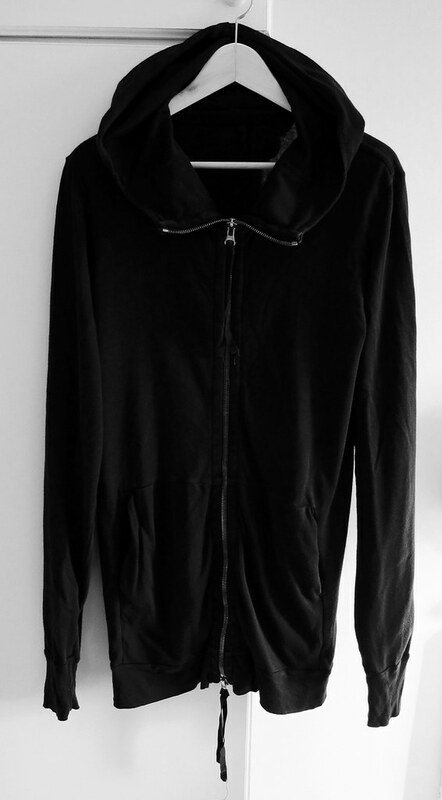 The piece is a long black hoody from the first Silent by Damir Doma collection. It serves as a reminder of a feeling and a decision. i do applaude him. he is very clear about how he feels at that goes for his state of mind. i couldn't do it, not that i have loads of clothes, but i just don't wash them enough! Been awhile since I managed to comment Steve but I will admit I've been hovering around the blog the whole time! And there will be more comments to come (quality not quantity, hence why I haven't been commenting so much, your posts are so meaty and delicious that I know I need both time to digest and form an opinion on). Syed is such a wonderful thinker and I love how it has come across so clearly in these two garments. "I would rather own only a handful of things that I truly cherish, than a house full of things that are 'nice enough'. " - I think we're all trying to do this but Syed evidently has willpower to go ahead and do so. Bravo! Should we start a Wardrobe Builders either guild or anonymous group (with coffee and biscuits in old churches....)?